When it comes to their commitment to sustainability, these six flooring companies are strides ahead. Pinnacle Award Winner: Crossville, Inc.
CROSSVILLE RECEIVED THE 2012 GreenStep Pinnacle Award for its development of technologies that allow it to recycle fired tiles. Recycled Tile Crossville’s Limestone porcelain collection, made in the U.S. through the company’s EcoCycle Tile Process™, comes in five contemporary colors and field sizes ranging from 3” x 6” to 16” x 24”. Limestone contains a minimum of 20% recycled content and is Green Squared certified. Became the first U.S. tile manufacturer to attain third party certification for waste recycling processes through Scientific Certification Systems (SCS), verifying that the company recycles approximately 12 million pounds of previously land-filled filtrate, fired tile and pre-consumer sanitary ware. Became a net consumer of waste, meaning the company consumes more manufacturing waste than it generates. Achieved recycled content production across 100 percent of the company’s U.S. manufactured product lines. Recycled content varies from 4 percent to 50 percent depending on product. Entered a landmark partnership with TOTO, maker of luxury sanitary ware, to recycle pre-consumer fired porcelain fixtures, thus contributing to at least 4 percent recycled content for all Crossville products. Made history in a Cradle to Cradle installation project for Chicago’s renowned, 43-story Federal Building by harvesting all 200,000-plus pounds of porcelain sanitary ware from the building and recycling it to create 65,000 square feet of porcelain tile to install in the project. This came above and beyond Crossville’s established, industry-changing green processes, including the Tile Take-Back Program, the innovative process that solved the major environmental problem facing the tile industry today: the recycling of fired tile. Though Tile Take-Back involves a proprietary recycling process, Crossville made the program barrier-free, openly recycling fired tile regardless of manufacturing/brand origins. Crossville has always invested in green practices and processes, prioritizing sustainability over profit and minimizing environmental impact wherever possible. The company reuses more than 99.98 percent of water used in manufacturing (the nearly imperceptible portion not reused is returned clean to the environment). Keeps superior air filtration/circulation and stringent standards for safety/cleanliness in the plants to ensure employees work in uncontaminated, hygienic environments. Prints marketing materials at Forestry Stewardship Council (FSC)-certified facilities, using soy ink and recycled paper whenever possible. Packages samples, merchandising and piece goods with recycled/recyclable wrapping and cushioning. Maintains a company-wide recycling program for all office/production facility paper and plastic waste. Encourages employees to bring recyclables to work for collection, as the local county offers no formal recycling effort. SHAW INDUSTRIES RECEIVED a GreenStep Pinnacle Award Honorable Mention for its efforts as the world’s leading recycler of carpet, as well as for its sustainable efforts spanning the entire scope of its operations. Shaw was the first Pinnacle Award winner in 2009 and has received the winning award or honorable mention in each of the four available categories. 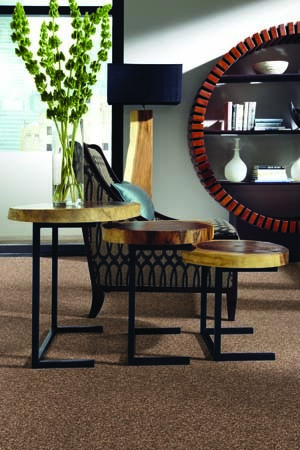 Shaw Floors’ Savory Days carpet is made with ClearTouch, a continuous filament fiber. ClearTouch contains 25% post-consumer recycled content, including plastic soft drink and water bottles processed in Shaw’s Clear Path recycling facility. Shaw reclaims all brands and types of postconsumer carpet and has recycled more than one half billion pounds of postconsumer carpet since 2006. More than 85 percent of the carpet Shaw reclaims each year is recycled directly back into new carpet through the company’s portfolio of postconsumer recycling processes. Shaw’s EcoWorx Recovery Technology facility deconstructs carpet tile made with EcoWorx backing and uses elutriation technology to shred and grind the carpet into a coarse mixture, which is then separated. All post-industrial waste generated at Plant 15, Shaw’s carpet tile manufacturing facility, is recycled using EcoWorx Recovery Technology. Every pound of waste carpet that goes in comes right back out in the form of new backing or fiber composites. Shaw recycles more than 100 million pounds of postconsumer nylon 6 carpet annually through its Evergreen Nylon 6 Recycling facility. Evergreen takes postconsumer Eco Solution Q and other nylon 6 carpets from other manufacturers and converts the carpet into caprolactam monomer, the building block of new nylon. Shaw’s Re2E facility generates energy from reclaimed carpet and carpet material from both internal manufacturing operations and postconsumer carpet collections. The operation’s alternative fuels-fired boiler is expected to convert more than 80 million pounds of reclaimed carpet materials annually into steam and electricity for an adjacent carpet manufacturing facility. Re2E will eventually generate enough electricity to power itself. Shaw’s Waste-to-Energy facility converts carpet and wood waste to steam energy through gasification. Shaw shears fiber from end-of-life carpet and converts it into engineered resins that are sold to other companies to produce—for example—automotive components. Shaw stopped classifying waste as waste, but rather as a valuable product that could be measured, tracked, monitored and channeled into new cycles of use and reuse. Bio-Tile Armstrong’s Striations Bio-Based Tile is made from 85% limestone, including 10% pre-consumer recycled content and Biostride, a polymer made with U.S.-grown plant ingredients. Available in 12” x 24” inch rectangles, this commercial product installs much like vinyl composition tile. ARMSTRONG RECEIVED THE GreenStep product award for its Striations Bio-Based Tile, which utilizes domestically grown, rapidly renewable plant matter and limestone as alternatives to PVC plasticizers. Striations combines aesthetics, function and value for commercial interiors. Visuals are inspired by ancient stone and time-weathered wood and come in a 12” x 24” linear format. 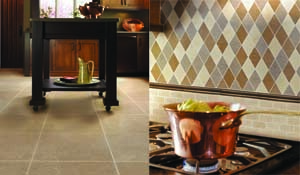 Design features are presented in a non-PVC tile made with 85 percent recycled limestone. Striations’ essential polymer ingredient is BioStride, which is made with a domestically grown, rapidly renewable plant source. BBT reduces reliance on petroleum and fossil fuels. Striations provides equal or better performance over standard composition tile. It has twice the indent resistance and more than five times greater impact resistance than standard composition tile—all at an affordable cost. Made in the U.S. at Armstrong’s Jackson, Mississippi, plant, the product contains at least 60 percent content from U.S. sources and 10 percent pre-consumer recycled content (recycled limestone). Modello™ One of the Quick•Step® collections offering planks up to 54” in length, which create a more authentic hardwood floor look when installed. 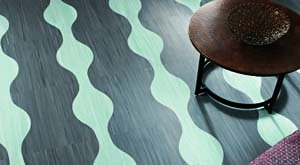 Glueless installation reduces VOC emissions and means Quick-Step floors can be reused and reinstalled several times. 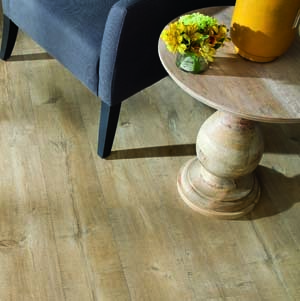 QUICK-STEP RECEIVED AN honorable mention in the product category for its high use of recycled content in the creation of its laminate flooring. A Quick-Step floor can be reused and reinstalled up to three times. The patented technology found in Quick-Step’s Uniclic glueless installation locking system gives Quick-Step flooring its unique ability to be effectively reused so many times. Any wood material that is not fully utilized during the production of the coreboard is sent to a third party where it is combined with other recycled wood materials for use as fuel, mulch or as an absorbent. During the production of Quick-Step products, every part of a tree is utilized. Quick-Step does not require glue during installation, so its floor offers low VOC (Volatile Organic Compound) emission levels. 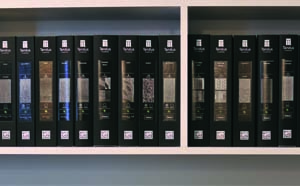 Sampling System: Tandus Flooring’s chipboard books are lined with FSC-certified paper containing 30 percent post-consumer waste; covers are made of 100 percent renewable book-binding cloth. TANDUS FLOORING EARNED THE GreenStep process award for its portfolio and sampling system. “We’re honored to receive this award, because it’s rare for a material delivery system to be recognized,” said Tom Ellis, vice president of marketing at Tandus Flooring. Innovated 100 percent recycled chipboard books—lined and used laser technology to replace printing. Eliminated glue, metal and Velcro with a friction-based system. Replaced samples so that books never leave the designer’s shelf. Replacement samples are shipped to libraries. Recycles, repurposes and reuses 100 percent of portfolios at the end of their usable life. Pioneered Green Virtual Samples that replicate physical samples on 100 percent postconsumer recycled paper. Reduced the carbon footprint with full scale printed Powerbond designs, eliminating 72,000 sq. ft. of product samples, 10,000 lbs. of nylon, 44,800 gallons of water or 1,500 bathtubs and 216,000,000 BTUs of energy, equivalent to 1,564 gallons of crude oil. recycled through the company’s ReStart® Reclamation Program. TARKETT RECEIVED A process honorable mention for its ReStart Program. Launched in 2003, Tarkett’s innovative ReStart program entails the recycling of commercially installed flooring, installation waste and product samples. One example of the program in action is Nationwide Children’s Hospital. Due to the intricate nature of the flooring design, a large amount of pattern cuts were generated throughout the installation process. Owners and contractors worked with Tarkett to participate in the company’s ReStart program. To date, more than twenty large containers of scrap have been returned to Tarkett. 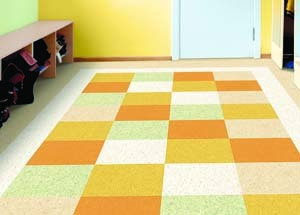 A key component of Tarkett’s Balanced Choice philosophy, ReStart enables commercial flooring job scrap (rubber, vinyl and linoleum tile and sheet, wall base, floor finishing accessories and tread-cuttings)—along with installed, postconsumer VCT—to be collected, returned and repurposed or recycled. Raw material excess, scrap and off-spec product is captured and reused in the manufacturing process or repurposed for other uses. Tarkett created a ReStart award, honoring those who fully utilize the program. Since its inception, the ReStart program has recycled more than 900 million pounds of material, diverting it from landfill. Which flooring products and companies are making the biggest strides toward sustainability? 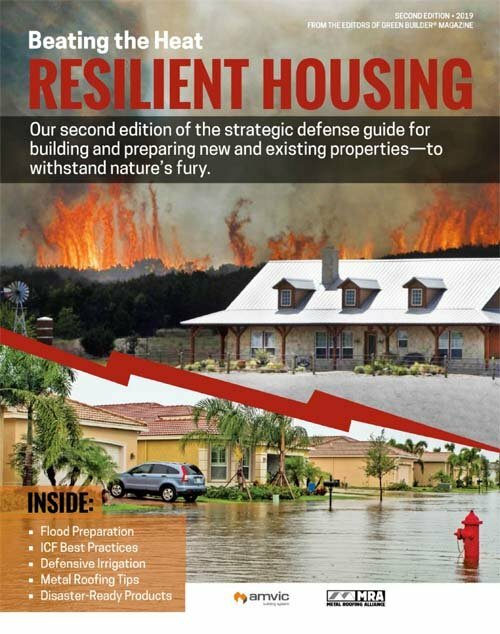 To answer that, we’re reprinting Floor Covering Weekly’s (FCW) coverage ot their fourth annual GreenStep Awards. The ceremony recognizes environmental achievements and stewardship within the flooring industry. Four winners and four honorees were chosen across four categories (Pinnacle, Product, Practice/Process, Promotion) by a panel of six judges: Michael Martin, president and CEO, National Wood Flooring Association (NWFA); Dr. Robert Peoples, director of the American Chemical Society, Green Chemical Institute; Bill Dearing, president, North American Laminate Flooring Association (NALFA); Bill Griese, standard development and green initiative manager, Tile Council of North America (TCNA); Cammie Wietzel, general manager, World Floor Covering Association (WFCA); and Dean Thompson, executive director, Resilient Floor Covering Institute (RFCI). Reprinted with permission from Floor Covering Weekly magazine. What Makes a Kitchen Green? What Makes a Bathroom Green?